Nestled between mountain and sea, the Grootbos Private Nature Reserve is a five-star eco-paradise showcasing the incredible Flora and Marine life of the Southern Tip of Africa. Only 2 hours from Cape Town and 30 minutes from Hermanus, you’ll discover where ultimate luxury meets nature. Because we loved this slice of fynbos paradise so much, we decided to treat one lucky couple to a romantic weekend away! Step 1. Like The Travel Manuel and Grootbos on Facebook. Step 2. Like and Share the Competition Post on Facebook. Step 3. 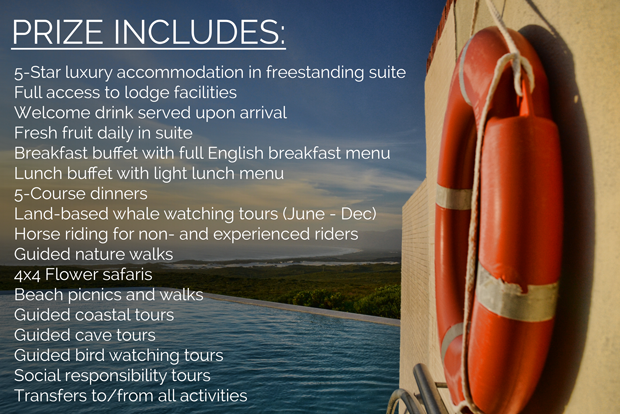 Complete and submit your details in the “Grootbos Giveaway Form” below. Additional entries – highly encouraged! 4. Follow The Travel Manuel and Grootbos on Twitter. 6. Go to the Grootbos YouTube channel, choose your favourite video and share on Facebook, Twitter ( The more the merrier and the better your chances of winning). 1. Participants will only have a valid entry into this competition if they complete all compulsory steps to entry. 2. Competition closes on 9 January 2015. The draw is random and the winner will be announced on 10 January. 3. Once the winner is announced and contacted via email, you will have 24 hours to confirm that you are available to claim the prize. If not, we will draw another winner. 4. The Travel Manuel is not responsible for the distribution of the prize. If your name is chosen we will pass it on to Grootbos who will manage all further liaisons. 5. This prize excludes any transfer to Grootbos, you will have to find your own way there and back. Shared on google plus too. My Boyfriend and I would love this experience! This is an amazing prize. I am dreaming of visiting beautiful Grootbos for a very long time now. Would be the best Christmas present ever. Followed all the rules, tweeted, liked, shared, g+1’d even! Great competition!!! This sounds AMAZING!!! :) This would be the best way to start 2015!! omgoodness. what a way to start 2015! What a great competition! Hope the most deserving one wins! Wow – what a dream come true to win this!! Amazing place, amazing prize…all digits crossed! I’m turning 30 on January 23rd… What an amazing birthday it’ll be! Oh baby! This would be the perfect christmas present for my boyfriend who is stuck working right through the christmas season and cant take leave until Jan :( please pick me!!! AMAZING prize! Just in time for my boyfriends 30th birthday. Would love to treat him to a surprise weekend! Truly incredible place in a breathtaking part of South Africa. This is the kind of getaway that dreams are made of! South Africa is truly an amazing place! So many places to see and experience! This has been my dream get away for ages and what an amazing Christmas surprise it would be to win! What an amazing prize. Have entered and shared and truly love your blog! Really hoping to win this amazing. Wow this would be a truly amazing experience! wow – would love to win this!!!!!! So tranquil! Love this precious part of the Western Cape. Got married at Grootbos 3 years ago, wanting to go back there ever since! What an Epic place! Most beautiful place! Just love Grootbos! Would love to win this! Aah would love to spoil my boyfriend! Would love to win this!! The husband and I haven’t had a weekend away since our son was born 14 months ago. would absolutely love to win this. Hubby and i have been drooling and dreaming about Grootbos for years!!! Would be a perfect anniversary getaway. No words… this would be so amazing!! Don’t have twitter :( Hope this does not limit my chance of winning this amazing prize!!!! Hi Carren, you can still enter but sadly won’t be able to capitilise on two additional entries. Good luck! Stunning! A getaway like this would be amazing and such a treat! What a way to start the new year – looks amazing! That would be the perfect way to see in the new year!!! New year, new beginnings and new memories. It’s been a hectic year, this would be the BEST prize! My fiancé finishes his MBA on Monday and I would love to be able to treat him to a weekend away before he disappears to study for another 5 months in China on exchange in March. He’s worked so hard this year, as have I in supporting a full-time student. Holding thumbs! What a location for a little bit of heaven! Great prize! This would be an amazing getaway! Taking in all the beauty. Incredible, for our anniversary in Jan this year my husband and I found a gem almost as beautiful as this one…imagine if we could escape to the ultimate retreat for our first anniversary. Bliss! Oh how incredible would this be to win! Totally would be amazeballs after one heck of a year! Radical prize – keep up the awesome job Lauren and Vaughan! We are having a baby, and this break would just be so magic to keep us grounded and together in this special but challenging time. We both work so hard in the events industry, all weekends, late nights so a break is desperately needed. we really need this! Been a manic year of wedding planning and CHAOS! Please!!! What an incredible prize to win! I grew up in Hermanus and have always known about Grootbos, but never visited- I feel like this would be an amazing opportunity! This would be so amazing!! My boyfriend got retrenched and has decided to start his own business in February 2015! A holiday would be a great way to rejuvenate before his great new adventure! I am just in it for the horse riding and sunsets! I love my Africa!!!! What an incredible competition! Holding thumbs so much for a chance to experience this beautiful place. Grootbos is one of my favourite destinations near Cape Town. It really feels like a whole other world with so much to offer. My fiance and I had a great experience and it would be so incredible to go back once we are married! This looks awesome! Hoping to surprise my husband for Christmas! this would be a great spot to celebrate our January anniversary. 4 years, one baby and another coming in 2015. love the views across the fynbos. This is an incredble looking place. What a fantastic jewel. Would so love this weekend away and your place looks AMAZING! Been a crazy year for us, with a move to CT, with 2 small children, away from family and lets face it, feeling pretty exhausted. This looks like the perfect place for us to unwind and relax for the first time in a long time. This is without a doubt one of the most magical places in the Western Cape! Watching the beautifully shot videos makes me feel like I’m on a plane again, with tingling travel excitement starting to buzz through my body, making me feel alive and free. Grootbos, you’re on my bucket list! This would be the best ever. Share share share!!! Grootbos is amazingly beautiful! Would love to visit for a weekend (or a lifetime)! Looks Stunning! Would love to go see it for myself! It would be a dream come true to win this prize. Have always wanted to visit Grootbos. Help me unplug and unwind, Grootbos sounds enchanting and just what I need to close off a hectic year! This looks like the ultimate bucketlist experience, i would cherish every second of this! I have heard so much about Grootbos and would do anything to win a stay here. I love being in nature and would be great to escape. Yes please. Would love to share this Grootbos experience with my wife. Didnt even know it existed.. Looks incredible. Looks absolutely gorgeous! I would love to spend a weekend tucked away in such beautiful surrounds :) Holding thumbs! Travel is by far the greatest gift, having that need and want to experience culture beyond your front door is either part of you or its not. Whether it be a different town, city, country or continent there is nothing I treasure more than that! I’ve dreamt about staying at Grootbos for ages. Fingers crossed as 2014 was a rough year. I just want to ride horses and hike along the beach and be happy. This place looks absolutely STUNNING! I have missed the beach so much and with our wedding coming up this would be a great prize (you know how expensive weddings can be).. I would really love to experience Grootbos! 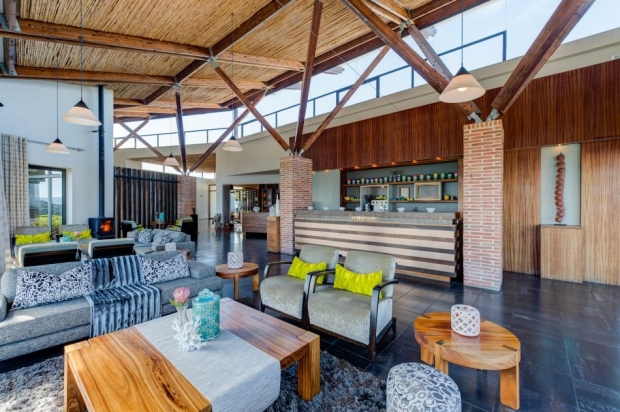 Grootbos looks like the ultimate getaway for a romantic weekend. I would love to take my partner here to escape the pace and hustle of the City and reconnect in nature. This would be an amazing holiday. I turn 30 on Jan 23rd. What an awesome place to forget that I’m old. It would be a well deserved holiday away for a hole year of work and reaping the good reward. Thank you for creating such an amazing prize its my bday in January it will be a year with the boyfriend so tech we still in our honeymoon period and i probably have been entering competitions like these for about 4 years and have literally NEVER won so please help me!! Would be such a treat to be able to have such an awesome experience. This would be a beautiful ending to our holiday together. 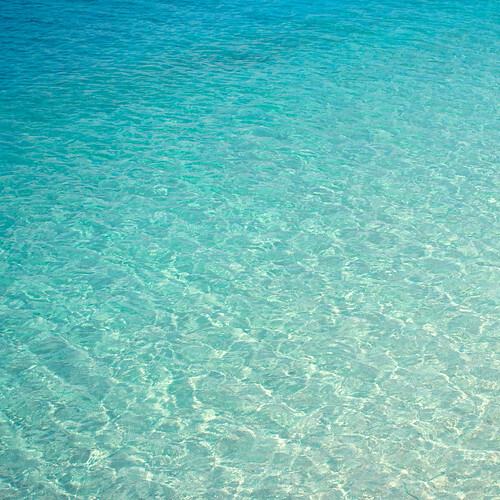 It seems like pure bliss. Oh his would be such an amazing trip for me and my boyfriend. We can’t go away over December as it is his peak season :( this place looks stunning, amazing, perfect!!! What an amazing competition! Would be the most amazing experience to have!!! What a wonderful competition. I would so love to be able to take my boyfriend there as a surprise trip for our 5 year anniversary, especially seeing as our first date was in Hermanus! So many happy memories. I love being surrounded by fynbos and mountains, with a good wine in hand and Grootbos looks like the perfect destination. It will be the most incredible experience to have our Honeymoon here! Our wedding is low budget and we are planning on going on honeymoon locally long after we get married and have saved up enough money. We don’t often get to go away and have a proper break. This will be incredible to win and experience with my husband-to-be! :) I cannot imagine a better bonding experience, out in nature. We’ve always wanted to go spend a weekend at Grootbos … My fiancé sharpens the chef’s knives regularly and so I’ve had the pleasure to have a glimpse of the beautiful venue and would love to have the chance to spend a weekend soaking up the atmosphere there…. I have been longing to visit this wonderful place called Grootbos in the Overberg for ages….have read so many excellent reviews and it sounds and looks incredible. If it’s good enough for Brad Pitt. Grootbos should blow us away. As a Mom of 4, who works full time, this would be an AMAZING getaway for the husband and I! Exciting competition!! Always exciting to see what The travelmanuel is up to in the world!!! I have been dying to visit Grootbos and this would be the perfect end to an amazing holiday over December and January. Holding thumbs, fingers and toes. Looks like just the most beautiful place. By the way I entered this comp on my phone and your mobile site looks great and all the links were functional. Great job! Wow! We are so lucky to have such beautiful places in our country we can visit. Gosh this is just what I need after 2014. After moving by myself from Johannesburg to Cape Town at the beginning of Winter, what a perfect way to experience the ultimate relaxation!! 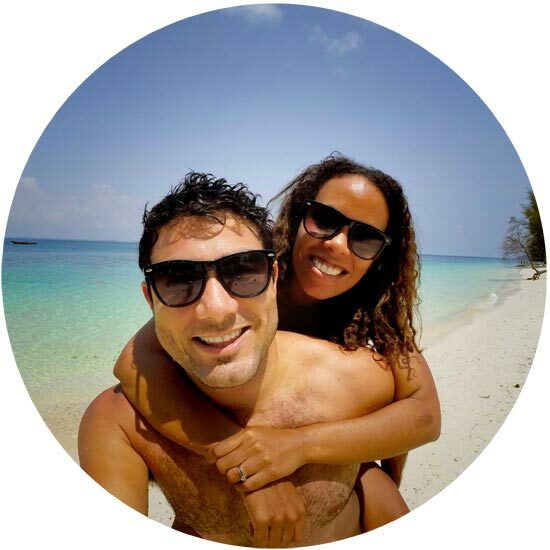 My husband and I have a love affair with this magical place, Grootbos… We have been fortunate to experience Grootbos on two occassions (we have to put alot of money away in our piggy bank for this spoil, but so worth it). Some of our best and most special family moments have been created at Grootbos…. Maybe third time lucky ?? This place has special meaning and memories…would love to venture into the ‘BIG BUSH’ needing a holiday and break so badly…you guys really know how to treat and spoil!!! I have heard only amazing feedback about Grootbos. I would love to experience it and the timing is right before having to go back to work and leave my baby – now that would be a real treat. Wow!!! This is definitely my kind of epic! Can’t believe how stunning the scenary is! Stunning settings! Would be a real blessing and glorious treat for my parents who have just gone through my dads bypass surgery! Now this is one awesome getaway to look forward to. And as the the youtube clip says…The Journey Begins at Grootbos! Avid follower of your blog. Keep up the good work and thanx for sharing all your amazing travel ventures…somehow it feels that I’m experiencing the awesomeness too be reading through your experiences. Oooh a little bit of luxury will go a long way towards making the start of 2015 GREAT! Would be lovely to escape to this beautiful destination with my loved one. What an amazing way to end off this year! Thanks for an awesome competition @thetravelmanuel & @grootbos! This is such an awesome prize. Just what we need after starting a family this year. A weekend away to focus on us! How amazing would this be! choose me! This would be such a wonderful break! my boyfriend (or i should say Fiance now!) proposed to me 2 weeks ago after almost 7 years together. I would really love to say thank you to him by spoiling him to a amazing weekend at this beautiful lodge because he also deserves to be spoiled! This would be incredible, a magical getaway in a magical space, exploring and relaxing. Grootbos is on my places to visit and this would be an amazing treat. I have heard so much about this place. I would love to go there for my 4th anniversary and husband’s birthday coming up!! Ahhhhh this is perfect! My husband and I celebrate our one year wedding anniversary AND he turns 30 in January! What better way for two poor missionaries to celebrate Gods goodness ;):):) yay for beautiful South Africa, the mcshanes and the fun of exploring! If I win this I am so treating my parents to a weekend get away. Such superstars…and they deserve the break. Would love to win the Grootbos stay as it would be such a treat over my birthday weekend! Holding thumbs! Ahhh wow! Grootbos looks incredible. I’ve heard about it before but never realised how amazing it really is. My boyfriend (now my fiancé) and I just got engaged. Whooohoooo!!! It would be such a nice breakaway in this very special time. We will definitely make a plan to get to Grootbos in the near future. This would be the perfect start to 2015. Holding thumbs, crossing fingers and toes. This would be a perfect way to celebrate my birthday! It looks amazing! Can’t imagine a better way to relax after a year’s long work. This fall on my birthday weekend-it must be fate???? would be an amazing experience! I was sent to photograph Grootbos for a magazine, and was absolutely blown away! The lodge, the activities, the staff, the views, the food and everything inbetween – would love to be able to soak it all in as a guest! This place looks amazing, can’t wait to check it out. I used to run an eco-resort and love seeing how other places are operated in pristine environments. The is by far the best competition ever. I have been dreaming of visiting Grootbos for so long. Almost 7 years married,but could never go on a honeymoon. This really would be the ultimate most awesome to happen to us :D big smile. It looks beautiful. Ever since I found out about Grootbos in has been on my bucket list! This prize would be so divine to start the new year #JanuaryHoliday P.S. Finding your insta & Facebook page was even better! I have been bitten by the travelbug & your posts make the holiday planning that much easier! Grootbos – What a beautiful place to experience! Would love to spend some of my leave days here! Perfect getaway for second honeymoon as we will be married 19 years on 20 Jan 2015. No better way than to celebrate at #Grootbos! This would be the most awesome treat! A welcome break in what is set to be a HECTIC year! Entered:) sounds like the best way to start off 2015 at the beautiful and breathtaking Grootbos. Gosh, what an absolutely beautiful competition! I just entered again to make sure I did everything correctly! This would be an amazing start to the new year!! This would be a fabulous trip. Perfect way to relax and forget your troubles for a time! What a brilliant idea for a competition – encouraging people to visit and experience new places such as Grootbos! I would love to win this, its just what I need! Wow, this looks incredible and LOVE that the building is in keeping with the natural beauty that surrounds it. Green buildings are the way forward! Would be a dream to win!!! i have only heard spectacular things about Grootbos and these videos make it look even more amazing! What a wonderful competition. Happy to spread far & wide cause who doesnt deserve this luxury break to get 2015 off to a good start. Working for an NGO doesnt usually allow for such weekends away and I’d love to spoil my boyfriend who treats me like a princess. Winning this would make me entire year! Grootbos is one of the most breathtaking and peaceful places, fingers crossed! Wow, what a prize! Thanks for making such awesome prizes available – great job guys! This is the weekend of my wife’s birthday, it is her first birthday as a married couple, this would be such a fantastic way to celebrate! Awesome prize and incredible place. Been dying to go there and would be the perfect start to our married life! Wow, I would love to win this. It looks beautiful. Awesome prize! Great birthday gift for me???? Would be fabulous to Win!! Would love to win this!!! My husband booked a surprise weekend here last year and I was super sick with flu!! I would love to surprise him and experience the Grootbos beauty again! Crossing fingers & toes! Awesome giveaway! Mother Nature is just showing off with this Amazing Place! Looks absolutely amazing, would be an amazing getaway for my fiancé and myself especially as she didn’t get a break over the busy festive season and could do with an amazing getaway ! Would love to win this amazing prize!!! I’ve always heard how utterly fabulous this place is, I would LOVE to experience it for myself! What an amazing prize! We never got to celebrate our 10th Wedding Anniversary. Would so love to celebrate it here. I really, REALLY hope that my fiancee and I will be the lucky ones! We met and started dating almost immediately after we met in July 2014, after I had spent my first of three months in Italy. It really was a case of definite interest that led to love from the first time we met. Since then the time we’ve been allowed to spend together has been quite limited since I have not been able to get anything better than a tourism visa, even after he asked me to marry him in April 2013. Besides the odd one or two weeks inbetween that he manages to slip away from his work as Equine Veterinarian, we only see each other 90 days in every 6 months. It has not been easy, but when you truly love someone it’s definitely worth the wait. Hopefully everything will change after we can get married later this year! He has been planning to come visit me during the last two weeks of January, so this romantic weekend at Grootbos couldn’t come at a more opportune time! I would love to show him more of my world and our beautiful country and I LOVE everything about Grootbos Private Nature Reserve! Please pick us! Everything about this is beautiful! Love it guys! Am so excited to hopefully win this prize as we have just got married and would love to have a little honeymoon treat! What a treat to stand a chance to spend some time in this gorgeous place! wow stunning place this would be a great gift for our anniversary and my husband birthday and our first weekend away. I visited Grootbos last year for lunch and had a wonderful three course meal. The views, service and food was just perfection!! I hope to visit again soon. This would be a perfect getaway for our 7 year anniversary coming up now! I have been wanting to explore Grootbos for ages now! The place looks incredible and I have only heard great things. It would be the most perfect place to celebrate 2015! Holding all my fingers and toes! Would be AMAZING to win this! The ultimate treat for my wife! Just sounds like exactly what I need! This destination is definitely a stunning one, would be the perfect 1st anniversary / birthday present for my wife! Would be such an amazing experience!! Looks fantastic and sounds incredible. Wow, such an amazing prize. This would be perfect for us, as we haven’t been away for a weekend in years and this would be such a treat! OMG i seriously need a girls weekend away, this would just be magical!!!!! Awesome competition (pick me pick me)! What an unbelievable giveaway! Never wanted anything more!